I love how this one turned out. Everything just seemed to work. 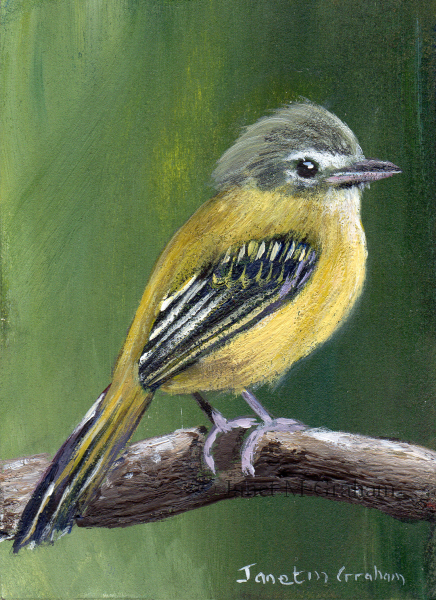 Piep Flycatchers are found in Europe and Western Asia and they winter in Western Africa. They measure around 12 - 13.5 cm in length. 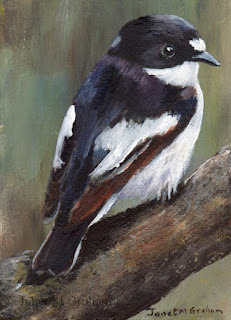 Piep Flycatcher measures 2.5 x 3.5 inches and is painted on 300gsm smooth Arches watercolour paper. 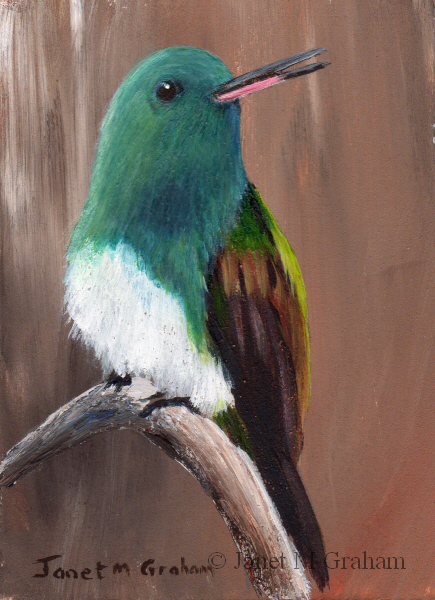 I decided to paint a aceo version of this lovely little hummingbird. Calliope Hummingbirds are found in the United States and Canada and winter in Central America. They measure around 7 - 10 cm in length and weigh between 2 - 3 grams. 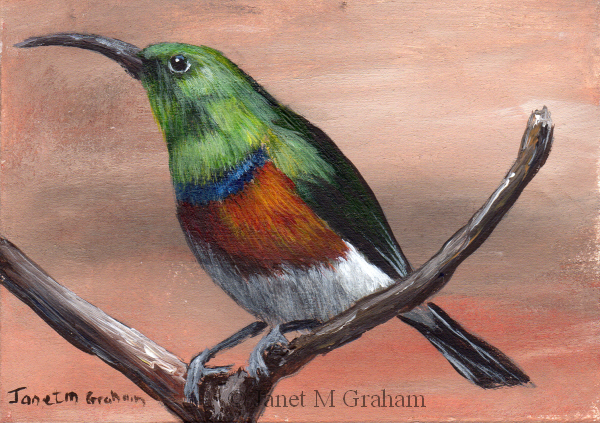 Calliope Hummingbird measures 2.5 x 3.5 inches and is painted on 300gsm smooth Arches watercolour paper. I am really pleased how this one turned out - everything just worked. Greater Double Collared Sunbirds are found on southern South Africa. They measure around 14cm in length. Great Double Collared Sunbird measures 3.5 x 2.5 inches and is painted on 300gsm smooth Arches watercolour paper. This one was a bit tricky to paint. I had to darken the background to get the bird to stand out a bit more and I used a few glazes to get depth to the feathers. White Throated Sparrows are found in North America. They measure around 16 - 18 cm in length and weigh between 22 - 32 grams. 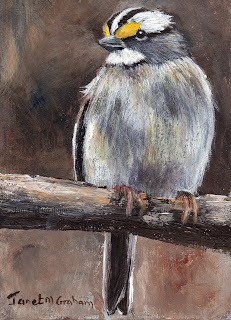 White Throated Sparrow measures 2.5 x 3.5 inches and is painted on 300gsm smooth Arches watercolour paper. My local art store had a 50% off everything sale on the other day and I have been thinking about trying out coloured pencils. So since they were half price I decided to give them a go. Purchased a tin of Faber Castell polychromos coloured pencils. I tried drawing a bird first but didn't like the result - much prefer painting them in acrylics. 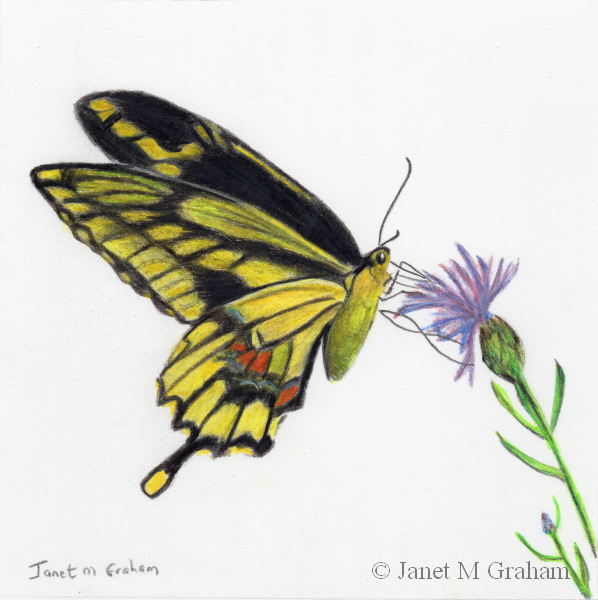 So then I did butterfly and was rather pleased with how it turned out. Next I am going to try them out on a Kangaroo as I think they will work rather well as I will be able to layer in different colours. Giant Swallowtail Butterfly measures 6 x 6 inches and is drawn on 300gsm smooth Arches watercolour paper. Really pleased how this one turned out - everything just seemed to come together. 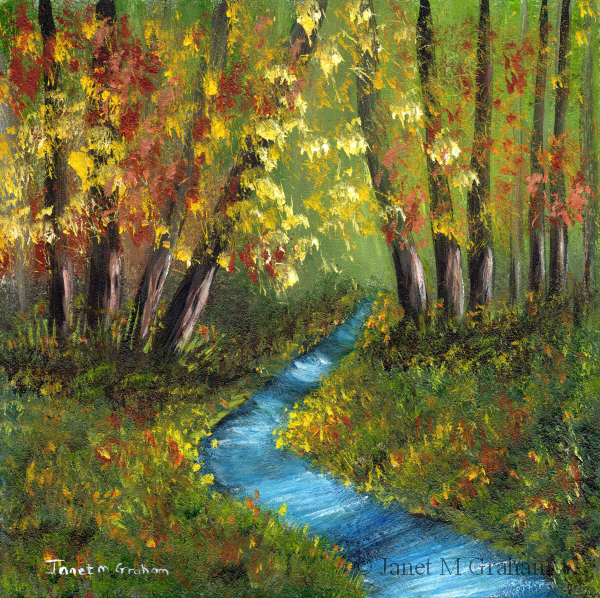 Summer Stream measures 5 x 5 inches and is painted on Ampersand Gessobord Panel. Whereas this one gave me problems. I lost count on how many glazes I did in order to get some definition to the feathers. In the end I got there and I am rather pleased with how it eventually turned out. Snowy Bellied Hummingbirds are found in Costa Rica, Panama and north western Colombia. They measure around 10 cm in length. 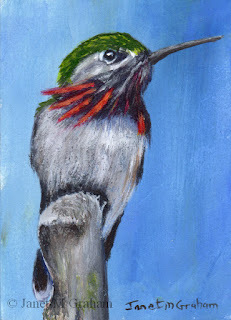 Snowy Bellied Hummingbird measures 2.5 x 3.5 inches and is painted on 300gsm smooth Arches watercolour paper. 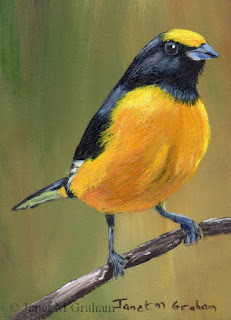 Black and Gold Tanagers are found in Colombia. It measures around 16cm. Black and Gold Tanager measures 2.5 x 3.5 inches and is painted on 300gsm smooth Arches watercolour paper. And another Australian robin. 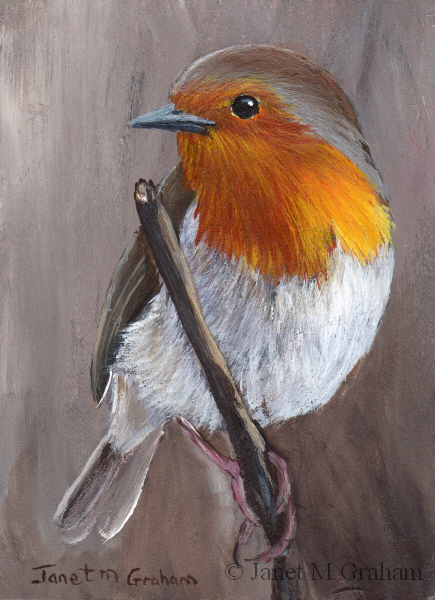 I was on a bit of a roll painting robins - also want to paint another pink robin but I think I will leave that one until the new year. Really pleased with how this one turned out . Eastern Yellow Robin measures 5 x 5 inches and is painted on Ampersand Gessobord Panel. I haven't painted a little aceo landscape for a while so decided to paint this little winter scene. 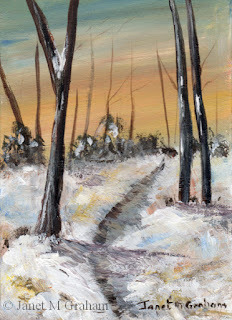 Winters Days measures 2.5 x 3.5 inches and is painted on 300gsm smooth Arches Watercolour paper. I absolutely love the position this one is perched in the branch. 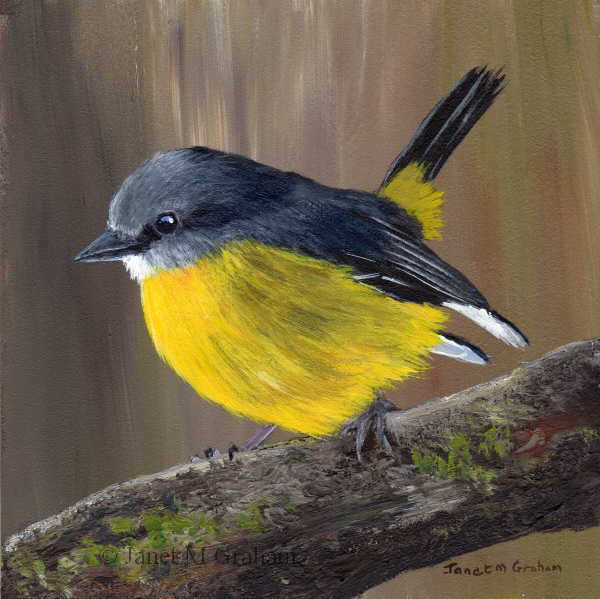 Tennessee Warblers breed in Eastern North America and winter in Southern Central America and Northern South America. They measure around 10 - 13 cm in length and weigh between 8 - 13 grams. 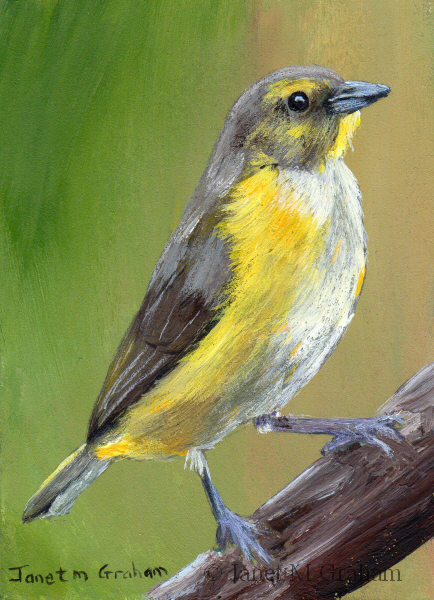 Tennessee Warbler measures 3.5 x 2.5 inches and is painted on 300gsm smooth Arches watercolour paper. 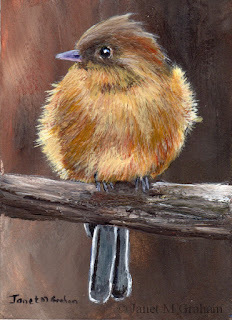 And another Australian robin - this one I decided to paint in the aceo size. It is interesting how many different species of robins there are here in Australia. I have only managed to see the Pink Robin, the Eastern Yellow Robin and the Pale Yellow Robin in person. Flame Robin measures 2.5 x 3.5 inches and is painted on 300gsm smooth Arches watercolour paper. 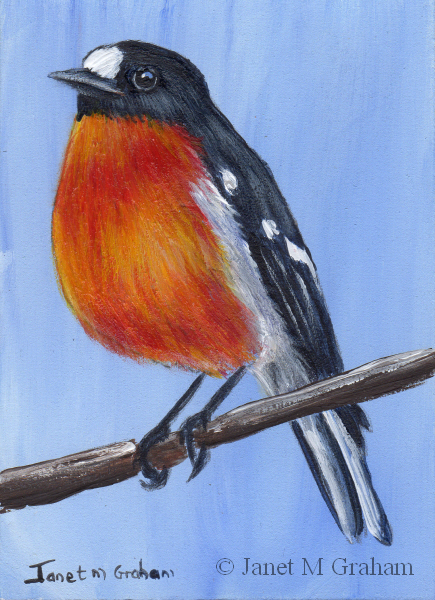 And the next one I painted is a Scarlet Robin. I love how this little guy is perched on the branch. 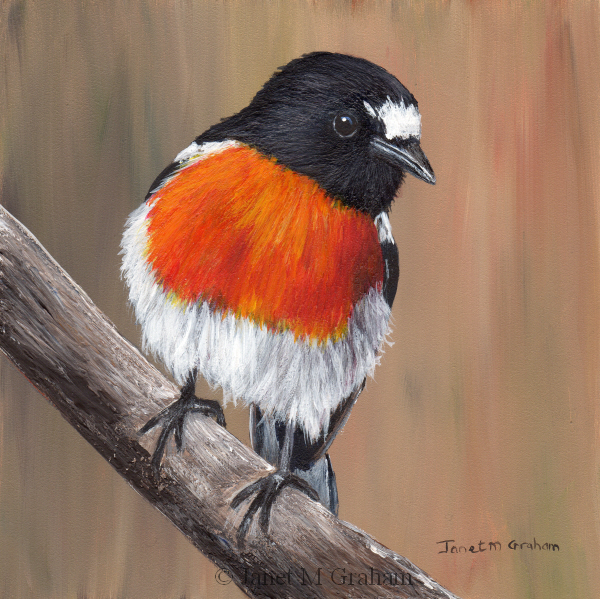 Scarlet Robin measures 5 x 5 inches and is painted on Ampersand Gessobord Panel. 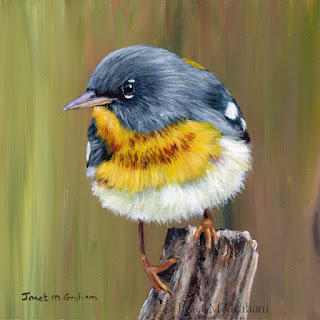 I love painting robins and decided to paint a few of our Australian Robins as I haven't painted any for a while. This is the first one - Red Capped Robin. 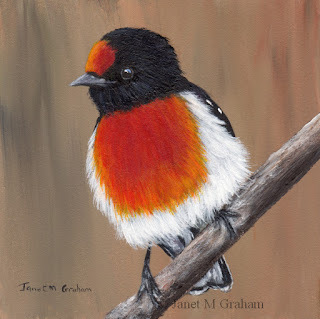 Red Capped Robin No 2 measures 5 x 5 inches and is painted on Ampersand Gessobord Panel. Love the colouring of this little chappie. 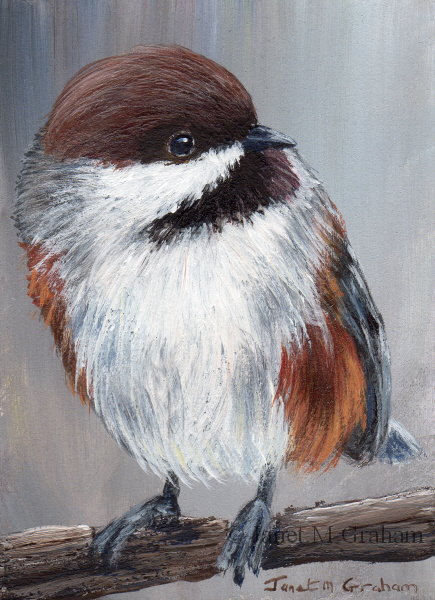 Boreal Chickadee measures 5 x 5 inches and is painted on Ampersand Gessobord Panel. I have had this one printed out for a while to paint. Really pleased with how it turned out. Lazuli Bunting is a North American songbird. They measure around 13 - 15 cm in length and weigh and weigh between 13 - 18 grams. 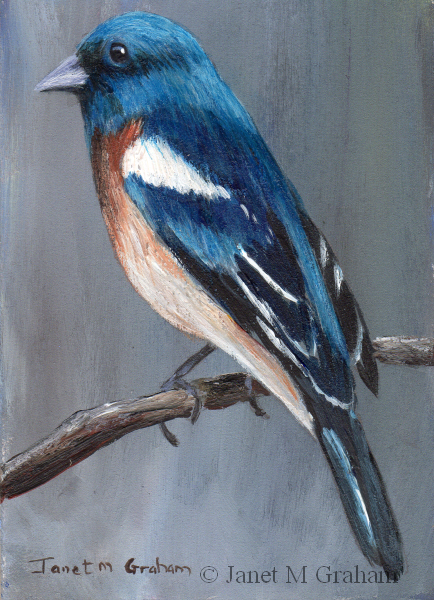 Lazuli Bunting measures 2.5 x 3.5 inches and is painted on 300gsm smooth Arches watercolour paper. Saffron Billed Sparrows are find in Brazil, Argentina, Bolivia and Paraguay. The measure around 15 - 16.5 cm in length and weigh between 22.1 - 28.1 grams. 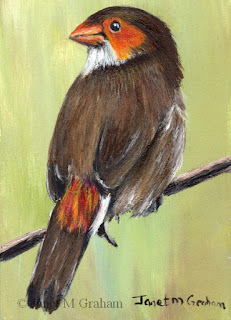 Saffron Billed Sparrow measures 2.5 x 3.5 inches and is painted on 300gsm smooth Arches watercolour. I love the different angle this little fellow is perched on the branch. Really pleased with how it turned out. Tufted Titmouse No 4 measures 5 x 5 inches and is painted on Ampersand Gessobord panel. This is another one that I have had printed out for ages to paint. 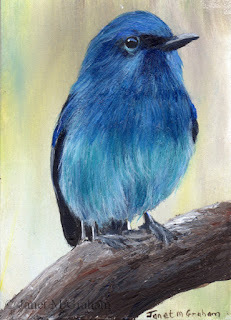 Really pleased with how it turned out - used quite a few glazes for the blue feathers. Winter Blue Jay measures 6 x 6 inches and is painted on Ampersand Gessobord Panel. Many thanks to Kim Fuoco for the reference photo. 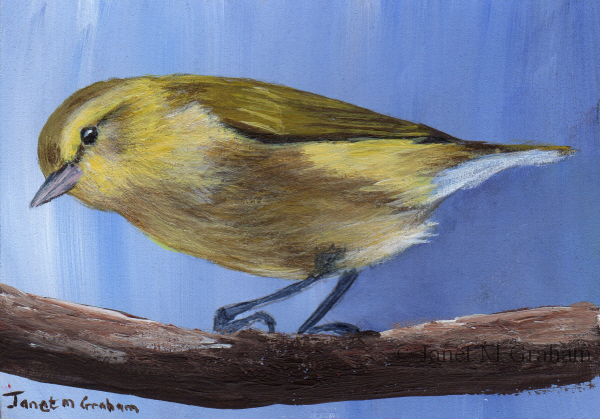 Orange Crowned Warblers are a small songbird found in North and Central America. They measure around 11 - 14 cm in length and weigh between 7 - 11 grams. Orange Crowned Warbler measures 2.5 x 3.5 inches and is painted on 300gsm smooth Arches watercolour paper. 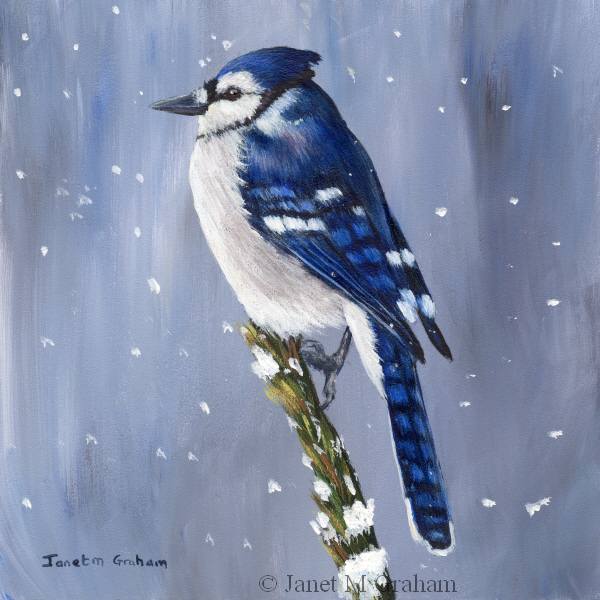 I had to use quite a few glazed of different blues to get some depth to the feathers - really pleased with how it finally turned out. Pale Blue Flycatchers are found in Bangladesh, Bhutan, Brunei, Cambodia, China, Hong Kong, India, Indonesia, Laos, Malaysia, Myanmar, Nepal, Thailand, and Vietnam. They measure around 16.5 - 18 cm in length and weigh between 16 - 19 grams. 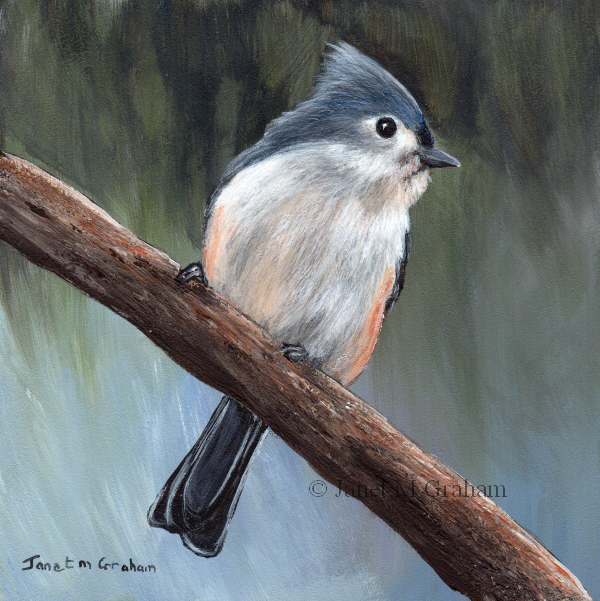 Pale Blue Flycatcher measures 2.5 x 3.5 inches and is painted on 300gsm smooth Arches watercolour paper. I have had this one on my list to paint for a while and with Christmas just around the corner, I thought it was rather an appropriate one to paint. Painting a red bird is always a bit tricky as you can't really use white to lighten areas. I ended up using quite a few glazes to get the depth to the feathers. 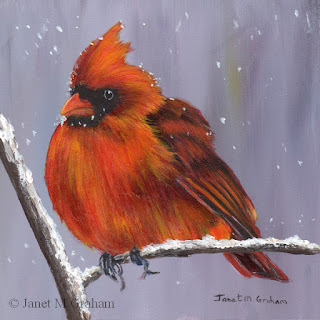 Winter Cardinal measures 5 x 5 inches and is painted on Ampersand Gessobord Panel. I love colouring of these kingfishers. 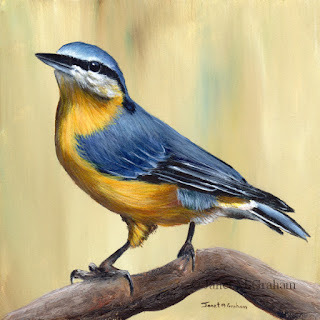 I used quite a few glazes to get the depth to the blue feathers. Really pleased with the final painting. 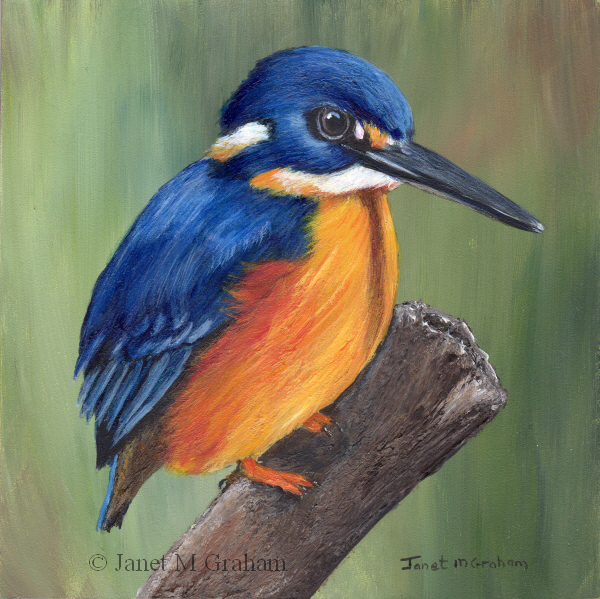 Azure Kingfisher measures 5 x 5 inches and is painted on Ampersand Gessobord Panel. Many thanks to Lynnie for the reference photo. 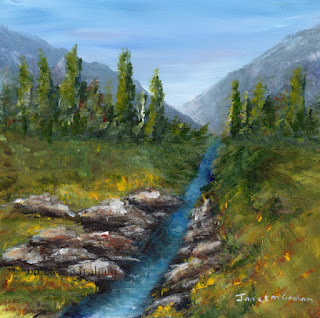 For something different, I painted this little landscape scene. 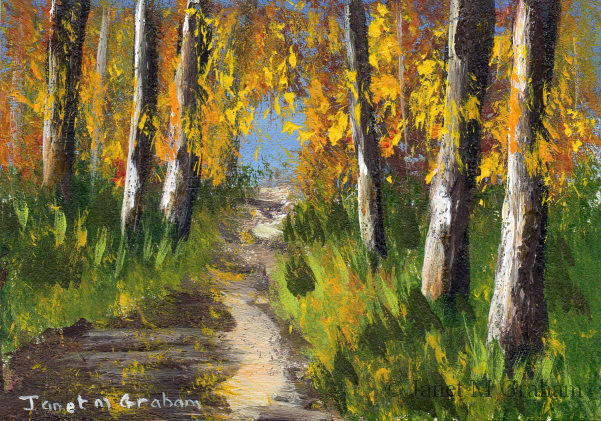 I used a flat brush for about 99% of the painting which worked rather well. 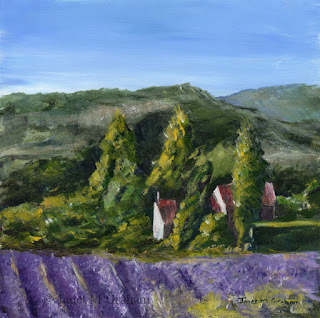 Lavender Farm measures 6 x 6 inches and is painted on Ampersand Gessobord Panel. Many thanks to Franklin for the reference photo. This one was a bit tricky to paint with the different angle to its head. Really pleased with how it turned. The Orange Cheeked Waxbill is native to western and central Africa and measure around 9cm in length. 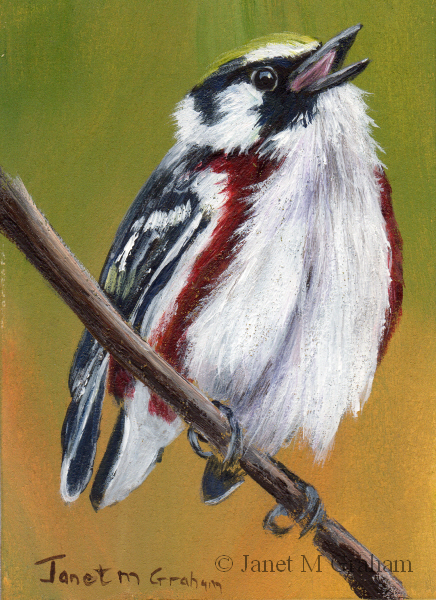 Orange Cheeked Waxbill measures 2.5 x 3.5 inches and is painted on 300gsm smooth Arches watercolour paper. Love how this one is perched on the the branch. Long Billed Wrens are found in Brazil. 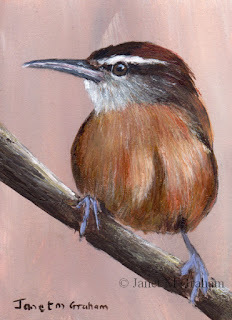 Long Billed Wren measures 2.5 x 3.5 inches and is painted on 300gsm smooth Arches watercolour paper. I love painting these birds as I just love their feather colours. Really pleased with how this one turned out. I love the different colour background of this one - it just seems to compliment the grey little bird perfectly. Really pleased with how it turned out. Black Tailed Gnatcatchers are a tiny songbird found in arid South Western United States and Northern Mexico. They measure around 11 - 13 cm in length and weigh between 5.1 - 6 grams. 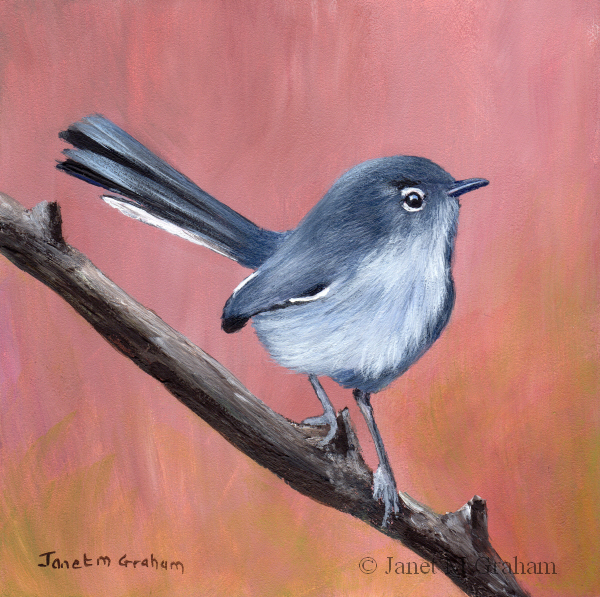 Black Tailed Gnatcatcher measures 5 x 5 inches and is painted on Ampersand Gessobord Panel. This one was interesting to paint re its markings. Rather pleased with how it turned out. Fox Sparrow's is a large sparrow found in North America. They measure between 15 - 19 cm and weigh between 27 - 49 grams. 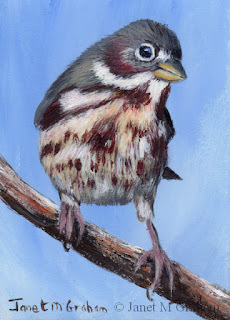 Fox Sparrow measures 2.5 x 3.5 inches and is painted on 300gsm smooth Arches watercolour paper. Love the colouring of this one. 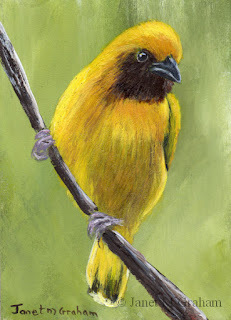 Southern Brown Throated Weavers are found in Africa. They measure around 15 cm in length and weigh between 16 - 31 grams. Southern Brown Throated Weaver measures 2.5 x 3.5 inches and is painted on 300 gsm smooth Arches watercolour paper. 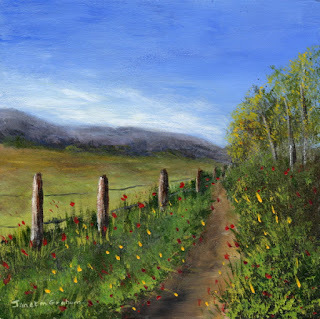 I changed this one quite a bit when compared to the reference photo by taking out the shrub foliage on the left to show the fields and mountain and I left out a large tree on the right. Really pleased with how the final painting turned out. 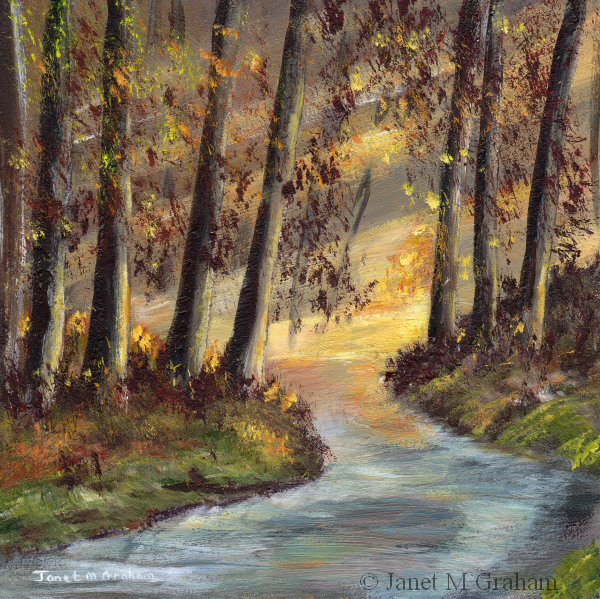 Country Track measures 6 x 6 inches and is painted on Ampersand Gessobord Panel. I couldn't resist painting this cute little fellow. 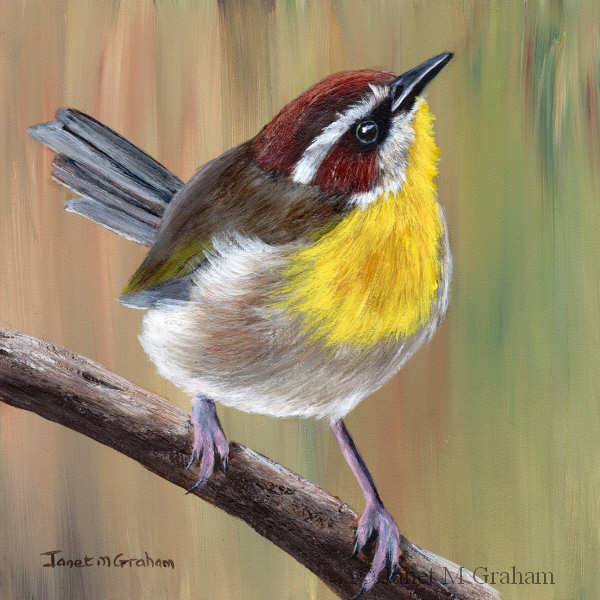 Rufous Capped Warbler measures 5 x 5 inches and is painted on Ampersand Gessobord Panel. I really love the pose of this little guy. 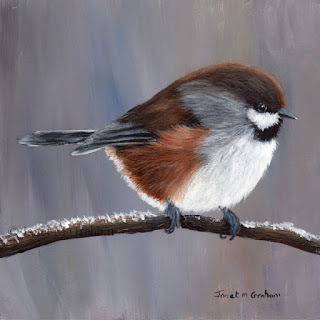 Boreal Chickadee's are found in Canada and Northern United States. They measure between 12.5 - 14.5 cm in length and weigh between 7 - 12.4 grams. 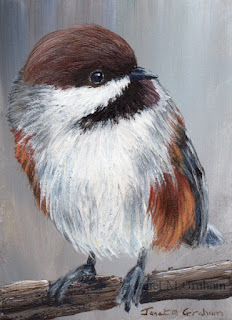 Boreal Chickadee measures 2.5 x 3.5 inches and is painted on 300gsm smooth Arches watercolour paper. I love the position this one is perched on the branch. Really pleased with how it turned out. 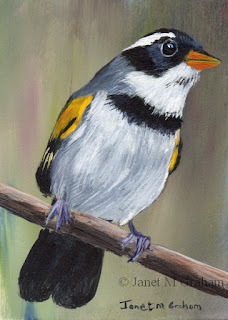 Stripe Throated Jery is found in Madagascar. Stripe Throated Jery measures 2.5 x 3.5 inches and is painted on 300gsm smooth Arches watercolour paper. Many thanks to Francesco Veronesi for reference photo. I love the colours of this one. 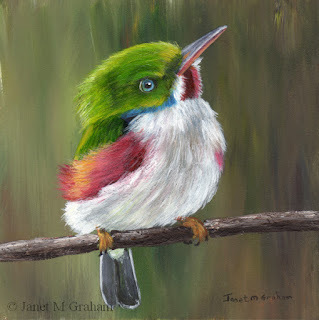 Cuban Tody's are found in Cuba and adjacent islands. They measure around 11 cm in length and weigh about 59 grams. Cuban Tody measures 5 x 5 inches and is painted on Ampersand Gessobord Panel. I am really pleased with how this one turned out - everything just seemed to work. 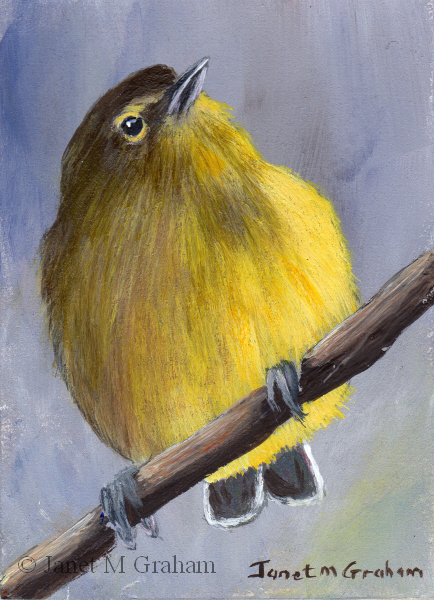 Northern Parula measures 5 x 5 inches and is painted on Ampersand Gessobord panel. Many thanks to Pixabay.com for the reference photo. I love the position this little guy is perched and I can just imagine him singing away. Chestnut Sided Warblers are a small songbird found in North America and Central America. They measures around 10 - 11 cm in length and weigh between 8 -13 grams. 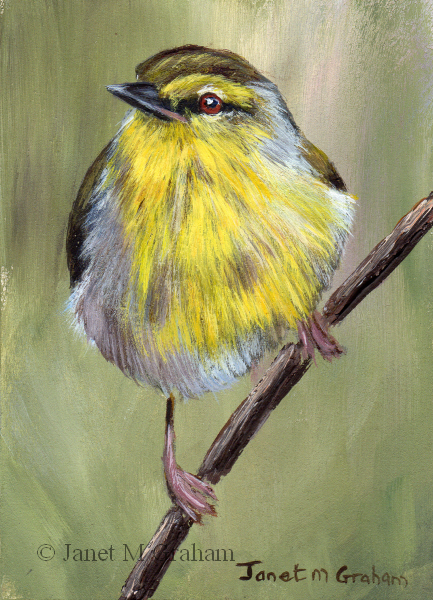 Chestnut Sided Warbler measures 2.5 x 3.5 inches and is painted on 300gsm smooth Arches watercolour paper. This one was a little bit more tricky to paint that I originally thought it would be as it took me quite a few goes to get the right colour mix for the feathers. 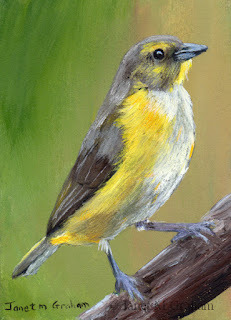 Yellow Olive Flatbill is also know as Yellow Olive Flycatcher and is found in Central and South America. Yellow Olive Flatbill measures 2.5 x 3.5 inches and is painted on 300 gsm smooth Arches watercolour paper. I finally managed to get some good shots of the Fairy Wrens down by one of the man - made lakes in my area. It was a perfect spot - the tree branch didn't have much foliage, the sun light was just right and the wrens stayed around for about 15 minutes hunting for insects and hopping between two branches. 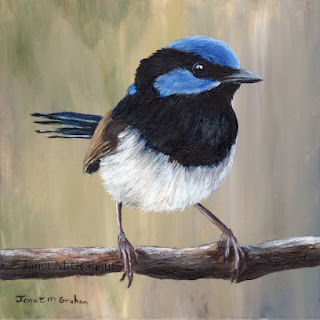 Superb Fairy Wren measures 6 x 6 inches and is painted on Ampersand Gessobord Panel. Love the position this one is perched on the branch. Really pleased with how it turned it. 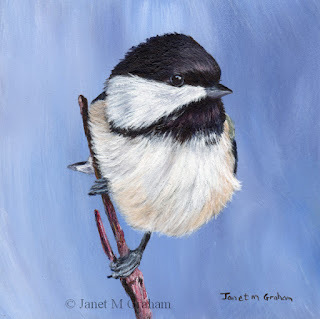 Black Capped Chickadee No 2measures 5 x 5 inches and is painted on Ampersand Gessobord Panel. Many thanks to David Mitchell for the reference photo. This one ended up looking quite a bit different to the reference photo. It sort of evolved as I was painting it. 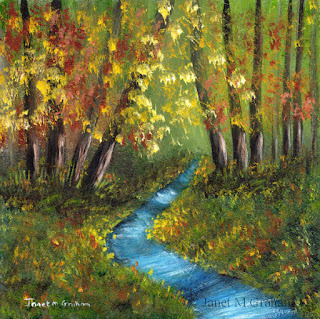 Autumn River measures 6 x 6 inches and is painted on Ampersand Gessobord Panel. 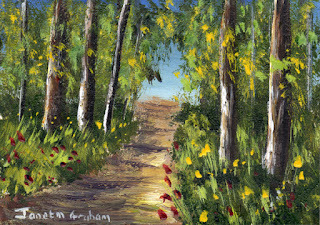 I needed a break from detail so painted a few landscape aceo's. I love how this one is all fluffed up. It was a bit more tricky to paint than I thought it would be. I ended up using quite a few glazes to get some depth to the feathers. 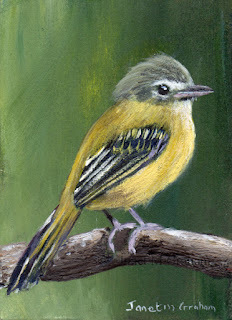 Tufted Flycatcher breed from North Western Mexico to North Western Ecuador. They measure around 12 cm in length ad weigh about 8.5 grams. 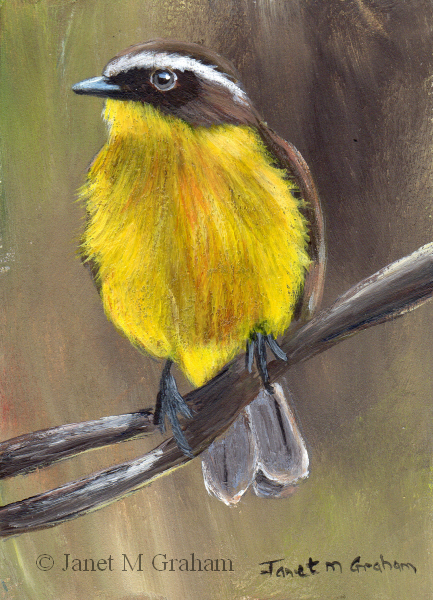 Tufted Flycatcher measures 2.5 x 3.5 inches and is painted on 300gsm smooth Arches watercolour paper. Enjoyed painting this one - everything just seemed to work. I used a few glazes to get the depth to the feathers. Rusty Margined Flycatchers are found in Northern and Central South America. Rusty Margined Flycatcher measures 2.5 x 3.5 inches and is painted on 300gsm smooth Arches watercolour paper. I love the way the light is shining through the trees on this one. Really pleased with how it turned out. 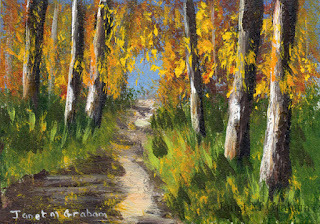 Autumn Morning measures 6 x 6 inches and is painted on Ampersand Gessobord Panel. Many thanks to Penny Colebourne for the reference photo. I love the contrast of the bird against the dark background. I used quite a few glazes to get the depth to the feathers. Really pleased with the final painting. 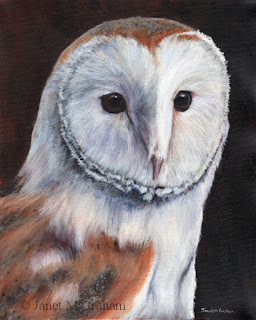 Barn Owl measures approx. 8 x 10 inches and is painted on loose unstretched Fredrix watercolour canvas. I love the feather colours of both the male and female of this species so ended up painting both a male and female. Really pleased with how both painting turned out. 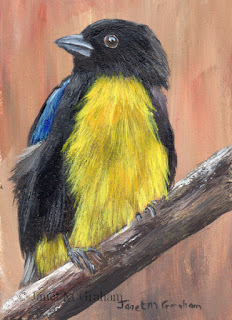 Purple Throated Euphonia are a songbird species found in South America. Many thanks to Dario Sanches for the reference photos. I love painting robins and I couldn't resist painting this one - love the angle he is perched on the branch. Robin No 2 measures 2.5 x 3.5 inches and is painted on 300gsm smooth Arches watercolour paper.